Blenheim is a charity that provides support services for alcohol and drug users, families and carers. We are committed to innovating and campaigning for best practice and positive change in the alcohol and substance misuse field. Read this blog by our Chief Executive, for our latest campaigns and what we feel passionate about. This month I will give oral evidence to the Advisory Council on Drug Misuse (ACMD). What I say is nothing new, it is a scandal and it leaves many dead and puts many other vulnerable people with a recognised mental health disorder at significant risk. I will be raising with ACMD our concerns over two principle issues surrounding our service users being released from custody. I will raise our concern at the high levels of drug related deaths in the immediate post custody period. I will raise the fact that service users are dropping out of treatment, or probably more accurately being dropped by the treatment system at a critical time. This renders them both more vulnerable to overdose, harm and relapse and undermines positive treatment and rehabilitation both in the community and in custody. I will highlight the recurrent practical barriers to continuity of care and to bring it to the ACMD’s attention a range of positive practices to address these. These issues are not new, report after report has raised them, I am desperate to see a solution but fear the work of the ACMD will gather dust on a shelf whilst people continue to die and miss opportunities to change their lives for the better. Why is this allowed to continue? It is simple in my view, society does not care enough about people who have been in prison with drug problems and agencies have failed to focus on people rather than paperwork. I will highlight the growing international evidence about the high risk of overdose and death of opiate using prisoners in the period immediately after release. Key government agencies are aware of this and I have personally sat in on briefings detailing the huge increase in the risk of death and overdose in the UK. I will point out that recent UK research has found the first week following prison release was the period of highest risk of mortality with drug related deaths the main cause. A Norwegian study found in the first week post release overdose accounted for 85% of all deaths of those transitioning back into the community. This will come as no surprise to anyone working in the sector. National drug treatment figures produced by the National Drug Treatment Monitoring System (NDTMS) show the shocking figure of just 30.3% of those in treatment in prison are in treatment 21 days after release. Even more alarming is the fact that 38% of those seeking continued treatment upon release are either not on medication or did not get the type or quantity they felt they required. The long standing failure to address this has been made worse by the changes in probation provision since the Governments Transforming Rehabilitation project in 2015, something Blenheim fought hard in Parliament to prevent. The depletion of criminal justice work within substance use treatment services following the cut in the Drug Intervention Programme (DIP) funding supporting it has further hampered the capacity to address this long standing issue. There are significant barriers to resolving these issues, not only the reduced funding at every point of the justice and treatment systems, but arguably a more significant barrier is the confusion and miscommunication caused by frequent realignment of services. There are excellent examples of good practice across the UK but good quality supported transitions between custody and community for people dependent on drugs are the exception rather than the norm. If we are to change this both criminal justice and treatment services it needs to be adequately resourced. We also need to see a returned to a proactive case management approach focused on people not paperwork. At Blenheim we are doing what we can to reduce these risks. The Grove in Haringey remodelled last year and their strategy works towards helping people that get stuck in the cycle of offending break free by working in partnership with the police, courts and prisons to identify those at high risk and put individual plans and interventions in place to best support them. Dave had been in and out of prison over the last 10 years and was stuck in a cycle of offending, homelessness and drug use. The Grove’s Prison Link Worker started working with Dave early on in his last sentence and they met regularly working on building coping techniques often used in the community, such as; relapse prevention, motivation, life skills and reconnecting with people. Dave wanted to attend rehab when he was released so Yvonne sought funding for this and arranged transport to the centre on his release day. Dave completed rehab, is abstinent six months on and has reconnected with some of his family. This sounds simple but if this was being done consistently across the UK then we wouldn’t be where we are today. I dream of a day when every prisoner has a successful transition from prison to community treatment. Having worked in the criminal justice system and drug misuse sectors for thirty years I know the barriers, I also know it is possible where there is a will there is a way. We have just seen the highest drug related deaths figures ever; these figures record deaths from drug poisoning, but services providers know that this is just the tip of the iceberg. There is an alarming increase in the numbers of people dying in treatment as a result of chronic ill health. An aging population of people with drug and alcohol problems are becoming unwell and often receive a poor service from the NHS in relation to their wider health needs because they struggle to navigate an increasingly complex treatment system and are often treated as undeserving by both our health system and local authorities that are under extreme financial pressure. Imagine that you are living with a completely treatable infection, that left untreated, can cause a life changing illness (for some ultimately death) and the health service said you had to wait until you developed this life threatening related illness before they would treat you. You would rightly be outraged. This is precisely what is happening to those who have hep C despite a range of new highly effective NICE approved treatments, with few side effects, that offers a cure for hep C. Only 3-4% of people a year currently get treatment. Unless you have a hep C related illness e.g. cirrhosis you are unlikely to be treated and even then it will have to be serious enough. Many of those with hep C who are not deemed ill enough to deserve treatment do not have their condition adequately monitored. Sadly many GP’s tell me that they monitor those with hep C who appear to be in reasonable health but then suddenly get ill very quickly, with often fatal consequences. This discrimination happens because around 90% of those with hep C contracted it via injecting drug use. Although many will have contracted hep C many years ago and have moved away from substance misuse they are often treated with suspicion. They are perceived as unreliable patients on whom expensive treatments are not to be wasted. Alongside this those most at risk of spreading hep C to others are seen as chaotic and thus undeserving or unsuitable. Naloxone is a drug that saves lives by temporarily reversing the effects of opioid drugs. It costs £18 or less per pack and is recommended by the ACMD, WHO, Public Health Ministers and PHE who actively support its wide provision to those at risk of opioid overdose. Despite this many local authorities, including Liverpool, are still refusing to allow treatment providers to distribute it, denying people access to a life saving tool at a time when we are seeing a significant jump in opiate related overdose deaths. Some years ago Liverpool hosted an international harm reduction conference recognising its historical place in the history of harm reduction in drugs services. In 2014, (after over 34 years of working in the drug, alcohol and criminal justice sectors, and as Blenheim celebrated 50 years of social action) I committed both Blenheim and myself to do everything in our power to ensure that the worlds best evidenced based treatment system was not destroyed by dogma, localism and cuts to public sector finances. Whilst recovery and ending dependency are hugely important we believe harm reduction is equally as important. Some of our sector’s best work is the daily interventions to keep people alive until they are ready to change. I was concerned then about disinvestment by local authorities in the drug and alcohol treatment sector to fund a wide range of other equally important and underfunded public health priorities. The subsequent cuts and impending disinvestment have exceeded even my most pessimistic view of the future. We face a return to a post code lottery of underfunded services, ill prepared for the next wave of alcohol and drug dependency or to support those in often chronic ill health. This year, 2016-17, we are seeing a 30% reduction in funding for drug and alcohol services with local authorities facing often impossible challenges, in the current financial climate, in meeting even their statutory responsibilities. With the ring fence coming off the public health grant and its abolition following the proposed introduction of Business Rate Retention, it will become increasingly difficult for local authorities to justify spending on drug and alcohol services when they cannot adequately fund services they are mandated to deliver. There is an urgent need to make the provision of a full range of drug and alcohol treatment services a statutory responsibility for local authorities. “Recent reduction in heroin use has been concentrated amongst the under-30s leaving behind a drug treatment population who are increasingly in frail health because of the cumulative impact of decades of drug addiction, problem alcohol use, poor diet, fragile mental health, and smoking. This leaves them significantly more vulnerable than their age would indicate and places a significant burden on mainstream NHS clinical services. “Despite this, drug and alcohol treatment is not a natural priority for local authorities, the NHS or public health professionals. This places this area of activity at particular risk from the negative consequences of the proposed replacement of the ring-fenced Public Health Grant with a system of business rate retention. There is growing evidence that local politicians feel that drug and alcohol treatment is an NHS function rather than a local authority public health function. Many are already uncomfortable at the proportion of PHE funding to local authorities that is currently spent on drug and alcohol provision. At Blenheim we work with a wide range of organisations and government departments to fight for drug and alcohol services and to ensure people in treatment aren’t discriminated against. In doing so we are supported at Westminster, by many hard working politicians from all major parties, who help us hold Government to account. Today is World Hepatitis Day, with the theme of Elimination. 2016 is a crucial year for addressing hepatitis. At the World Health Assembly in May, the World Health Organisation (WHO) Member States endorsed the first ever draft Elimination Strategy for Viral Hepatitis, with the ambitious goal to eliminate hepatitis as a public health threat by 2030. Hepatitis C is a blood-borne virus that can lead to scarring (cirrhosis) or cancer of the liver if left untreated. The virus is a serious infectious disease, but with the right early diagnosis and treatment, hepatitis C can be curable. Hepatitis C disproportionately affects the marginalised groups of people Blenheim works with, including intravenous drug users, prisoners and immigrant populations. Public Health England reported that in 2015 50% of injecting drug users have hepatitis C, up from 45% in 2005. Therefore, for years, Blenheim has called on NHS England, Public Health England and the Department of Health to make the elimination of hepatitis C a clear priority. We advocate that substance misuse services, the NHS and local authorities must do more to test, treat and cure those with hepatitis C.
In 2014, Blenheim became a member of the Hepatitis C Coalition – along with a group of leading clinicians, patients, organisations and other interested parties, we are committed to the reduction of morbidity and mortality associated with hepatitis C, and its eventual elimination. Injecting drug use continues to be the most important risk factor for contracting the infection because the virus is able to directly enter the blood stream via a needle. Approximately 50% of intravenous drug users are thought to be infected with the virus. Other forms of drug use, like sharing bank notes or straws to snort powders, also pose a significant risk of transmission. More information about risk factors can be found on the Hepatitis C Trust website. You can always go to your GP or GUM Clinic and ask to be tested for the virus. If you are accessing a drug or alcohol service then you should speak to your keyworker or a member of staff about having the test. Services can provide a blood-borne virus (BBV) test for you, but if this isn’t available then they will support you to arrange this with your GP, or another healthcare provider. These symptoms can usually be alleviated with therapy. However, the symptoms people suffer are not necessarily an indication of whether they have liver damage or not. Anti-viral therapies have advanced greatly in recent years and are now able to clear the virus, thus preventing the progression of liver disease. These NICE approved treatments cure the virus for around 70-80% of people. Treatment has been shown to reduce both inflammation of the liver and fibrosis. There is also evidence that cases of cirrhosis can sometimes be reversed through treatment. Decisions about treatment options should be made with your doctor. You can also contact the Hepatitis C Trust’s helpline on 0845 223 4424 for more information. In order to address the low levels of hepatitis treatment amongst our service users, in 2014/15, we introduced a range of initiatives in partnership with PHE, Hepatitis C Trust and the London Working Party on Hepatitis C. We have trained over 100 hepatitis champions throughout the organisation to identify the levels of hepatitis amongst our service users and to support the people affected with accessing treatment. And progress is being made. Last year, 94% of Blenheim’s new clients that inject drugs or have previously injected drugs, had a Hepatitis C test – an increase from 87% in 2014/2015. Furthermore, we are currently supporting the I’m Worth… campaign, which has been created to support people living with hepatitis C. It aims to address the stigma that many people with hepatitis C face, encouraging and empowering people living with hepatitis C to access care and services. It emphasises that everyone living with hepatitis C is entitled to the best care. To find out more about Hepatitis C, please take a look at the factsheet on our website. At the DAAT conference in early September 2015 I heard the drug related death figures for 2014. Despite having warned people they would be worse than the previous year I was shocked and deeply saddened. I have waited to write this blog to get my thoughts together. Last year I was shocked by the inaction of Government and many Local Authorities to the 2013 figures. I was going to talk about the Naloxone Action Group, positive action by the Department of Health, questions in Parliament and early day motions on naloxone. I was going to talk about the fact that since the 2013 drug related death figures came out, I and so many others have worked to try and understand what is happening and the cause. Personally I believe that increased heroin purity, poor heath and financial pressures on the drug treatment system are key factors in increasing drug related deaths. I also believe that action to increase naloxone availability in England will avert a significant proportion of these deaths. Without naloxone the figures would already have been, in my view, significantly higher. However the 2014 figures are shocking to me, every death represents a person, perhaps a father or grandmother, certainly someone’s child, grief and the waste of a life. I picture the funerals as a silent rebuke to do more. The figures are the highest since records began. As you read the statistics below, from the Office of National Statistics, take time to consider the people the figures represent. Heroin and morphine deaths rise by two-thirds in the past 2 years. 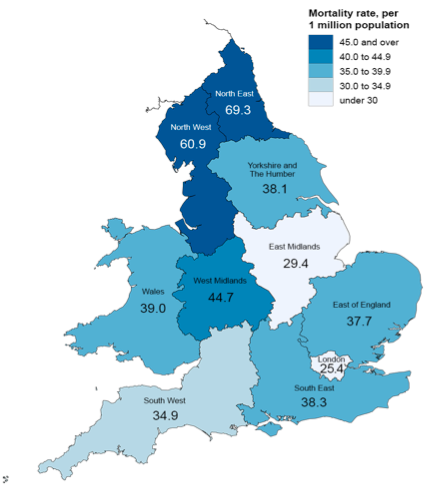 Within England, the North East has the highest mortality rate from drug misuse, London the lowest. 2014 registrations show drug related deaths reaching the highest level since records began. 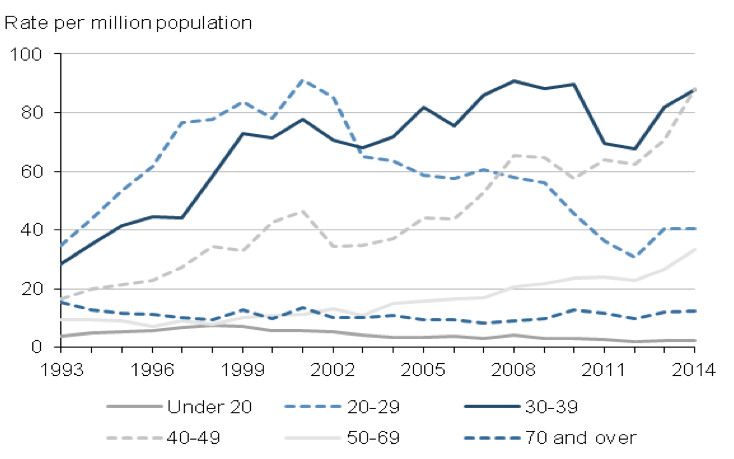 Majority of heroin deaths were among the 30-49 year old age groups. Males were over 2.5 times more likely to die from drug misuse than females. Two issues seemed important to understand after the 2013 figures and they remain the same after the 2014 set. Firstly what is causing the rise in deaths? And secondly what is being done to prevent them? A naloxone summit, hosted by Blenheim, bought together a campaign for a national naloxone programme in England. Through a FOI request we discovered the true extent of under provision of naloxone with only 32% of local authorities in England saying Naloxone was available. We formed the Naloxone Action Group England to ensure the regulations were changed, to ensure effective guidance was produced, and to ensure provision of naloxone across England. We got MPs to ask a range of questions in Parliament and gained support for an early day motion, sponsored by amongst others the current leader of the opposition Jeremy Corbyn and signed by the current Shadow Chancellor, John McDonald. This was not a party political issue; the EDM was also supported by current Conservative Minister Tracey Crouch. In total 32 MPs signed up to support wider naloxone availability. Letters to the Minister from the Drug Alcohol and Justice Parliamentary group, chaired by Lord Ramsbotham secured firm assurance that the Government would make the changes recommended by ACMD to make naloxone more widely available from October this year. Sadly, at the Naloxone Action Group we believe around 50% of local authorities continue to fail to provide naloxone. We will do a further FOI this year. Meetings at Chatham House with senior officials revealed clear evidence that entering and leaving drug treatment and/or prison are particularly dangerous times for overdose and death. Thus pressure to leave treatment early and failure to adequately manage transfer of those with drug problems from residential settings could seriously endanger lives. A drug related death summit held at the beginning of this year, hosted by Drugscope, Public Health England (PHE) and the Local Government Association, examined what might be causing the rise and to look at what might be done to reduce overdose deaths in future years. The attendees included policy makers from across government, commissioners, clinical and service provider leaders, and service user representatives. Commissioners and services should look at how they could supply naloxone more widely in the community to ensure those vulnerable to heroin overdose (including those not in treatment), their families, peers and carers are able to access the medicine. Over the last year we have seen PHE nationally, clearly assert the need for action to reduce drug related harm and publish significant guidance on naloxone and reducing drug related deaths. However, at a time when drug related deaths are at their highest ever level, to cut £200million from Public Heath funding to local authorities is truly outrageous. I am still ashamed to live in a country where things like the PHE £200 million cut happen at a time of evident need and many local authorities look the other way as people die as a result of the negligent failure to follow guidelines and supply naloxone. England has the best drug treatment system in the world; it exists because of the vision of far sighted people from all political parties and the dedication of amazing staff, organisations, charities and public officials over the last 50 years. Cuts in drugs and alcohol funding, along with the lack of political leadership and the lack of priority in England may in the coming years have a major negative impact on some of the most vulnerable people in our communities. The moving of drugs funding into Public Health England, where illicit drug use is not a strategic priority, has given a green light to some local authorities to make heart breaking cuts in services, Birmingham being one example. There has never been a more urgent need to have clear English government leadership matching that of Scotland. Spelling out the responsibilities of local authorities along with the levers to ensure they deliver. I would like the next government to take clear action to protect the best drug and alcohol treatment system in the world. Provide better opportunities for those in recovery and significantly reduce the death toll by committing to harm reduction, responding more robustly to rapidly increasing numbers of drug and alcohol related death and serious illness. I also would like to see a greater emphasis on responding to other health needs of those with drug and alcohol problems. Any government with an ounce of decency would follow the Portuguese example and move rapidly to bring hepatitis C treatment up to the standards of HIV treatment. If hepatitis C treatment was running trains only 3 in every 100 would get to work and many would die on the platform. Ensure comprehensive access to the life-saving drug Naloxone, across the whole of the United Kingdom, in line with World Health Organization (WHO), ACMD and public health guidelines and advice. People who inject drugs are the group most affected by hepatitis C in the UK: around 90% of the hepatitis C infections diagnosed in the UK will have been acquired through injecting drug use. Across the UK 13,758 hepatitis C infections were diagnosed during 2013. Around half of the people living with hepatitis C infections don’t know it, according to a new publication from Public Health England (PHE) ‘Shooting up: infections among people who inject drugs in the UK 2013’ published on the 5th November 2014. In total, 13,758 hepatitis C infections were diagnosed in 2013 in the UK, with around 90% acquired through injecting drug use. Around 2 in 5 people who inject psychoactive drugs such as heroin, crack and amphetamines are now living with hepatitis C, but half of these infections remain undiagnosed. This is why Blenheim in partnership with a wide range of organisations under the banner of the Hepatitis C Coalition is doing everything we can at a national, local and operational level to ensure more people at risk now or in the past get tested. I agree 100% with PHE when they state “Interventions to diagnose infections earlier, reduce transmission and treat those infected need to be continued and expanded, with the goal of reducing the prevalence of hepatitis C.” Current service provision needs rapid expansion. If caught early hepatitis C can be successfully treated with antiviral medications. Often, hepatitis C infection remains asymptomatic and is only diagnosed after liver damage has occurred. Left untreated hepatitis C infection can result in severe liver damage, liver cancer, liver failure, and even death. This is why Blenheim is appalled that only a shameful 3 out of every 100 people with hepatitis C are treated each year. Treatment can completely cure most people at a fraction of the life time cost of treating HIV. In 2013 there were 7,290 cases of tuberculosis reported in England, which is a rate of 13.5 cases per 100,000 population and TB is now one of PHE’s 7 priorities. My unscientific back of a fag packet approach suggests a rate for 21 cases per 100,000 population being diagnosed annually with hepatitis C. (Yes I adjusted for hepatitis C being UK and TB being England in relevant PHE figures). If this is the case PHE need to prioritise hepatitis C treatment and the treatment of injecting drug users. Indeed their own experts agree. Dr Vivian Hope, a PHE expert in infections among people who inject drugs, said: “with around half of those people living with hepatitis C still unaware of their infection, we need to do more to increase diagnosis rates. Ultimately, this will help reduce the current high level of infection we’re still seeing among people who inject drugs”. Dr Fortune Ncube, Consultant Epidemiologist and lead for PHE on Injecting Drug Use said: to reduce transmission and decrease rates of hepatitis C infection it is imperative that we maintain adequate provision of effective interventions such as needle and syringe programmes, opiate substitution and other drug treatment. With many services for drug and alcohol dependent people being cut back significantly across the country we are in danger of a continuing increase in the numbers infected with hepatitis C and even more people not getting the treatment they so urgently need. Lack of focus on harm reduction and shameful failure to roll out naloxone in England is leading to needless deaths. I feel deeply sad and ashamed to be part of a system that is letting this happen. I believe the failure of Government to roll out naloxone in England and a lack of focus on and dis-investment in harm reduction and drugs services is a factor in the 32% increase in heroin/morphine related deaths. Many people I suspect are now being encouraged to leave treatment before they are ready. There were 765 deaths involving heroin/morphine in 2013; a sharp rise of 32% from 579 deaths in 2012. Many of these fatalities could have been prevented by the use of naloxone as an intervention. The Advisory Council on the Misuse of Drugs (ACMD) undertook a review of naloxone availability in the UK and in May 2012, its report to the Government strongly recommended that naloxone should be made more widely available, to prevent future drug-related deaths. In Scotland and Wales, successful pilots resulted in national programmes to make naloxone widely available but there has been no similar national programme in England. Scotland has allowed naloxone to be provided to services without prescription, for use in an emergency. This enables Scottish drug treatment and homeless hostel staff to have naloxone ready for use. We urgently need the law in the UK changed to allow this. Naloxone is available on prescription in England to people at risk of opioid overdose. However, maximum impact on drug-related death rates will only be achieved if naloxone is given to people with the greatest opportunity to use it, and to those who can best engage with heroin users. The ACMD in May 2012 made 3 recommendations for government to take to maximise naloxone’s role in reducing drug-related deaths. Naloxone should be made more widely available, to tackle the high numbers of fatal opioid overdoses in the UK. Over two years later in July 2014 Jane Ellison Parliamentary Under Secretary of State for Public Health wrote to confirm that Government would act on the recommendations by October 2015 in England. Not only does this shamefully push the issue into the post election long grass it also makes no suggestion of a national programme similar to Scotland or Wales. Perhaps we should conclude that English heroin users lives are worth less than the Welsh and Scottish ones. Think I’m cynical; sources in Public Health England tell me a roll of naloxone is not on their agenda and they have no current plans.